So whaddya like on vacation: the beach or the mountains? If you’re a skier the answer is obvious. Same if you snorkel. If you’re chased by a shark and barely get out of the water with limbs intact, you may choose the mountains next time. If you’re in a plane crash and survive in a remote mountain area, you’ll pledge that if you ever get out alive, it’s beaches for you. Here’s a great example of the latter. 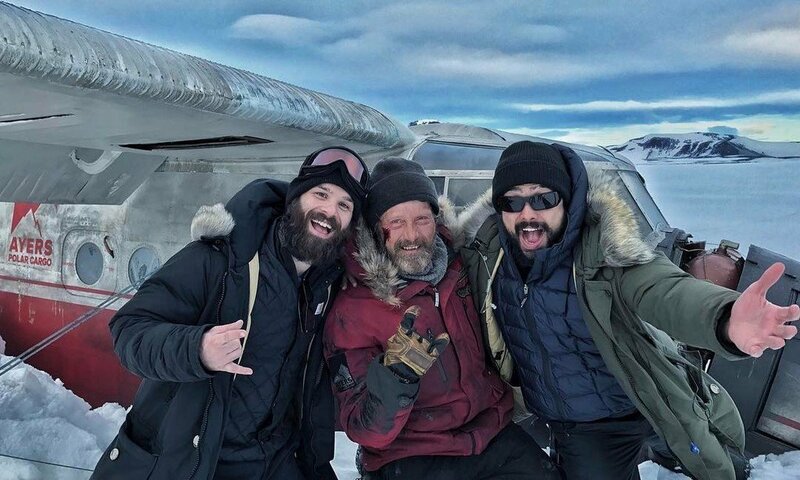 Though we don’t hear Overgård (Mads Mikkelsen) express a preference, he has crash landed in the Arctic (filmed by Tómas Örn Tómasson in the highlands of Iceland), has been there, we estimate, for two months, and doesn’t like his condition at all. Based on what his jacket says, he’s employed by a cargo company to deliver something or other and is now alone in the vast land mass of ice and snow with only the broken plane for shelter and heavy coats for warmth. Look at the kind of conflict he’s in. Remember that there is no such thing as a drama without conflict. Whether we deal with humans against humans (wars, fights), humans against themselves (suicide, depression), or humans against nature, we hope to be riveted by a good story. Perhaps humans against nature is the largest conflict: disease, starvation, volcanic eruptions, floods, tornadoes, hurricanes—these are our pressing problems and worthy subjects for movies. “Arctic,” for example, takes off by focusing on a man who has not invited conflict, he is not picking a fight against nature. He is brought down probably by fierce winds which will take a toll on a helicopter as well. Specifically, Joe Penna in his freshman turn as feature film director, motivates the actions of Overgård in a movie in which the only speech from the man is “Hey, hey!” or, when he meets-cute a woman (Maria Thelma Smáradóttir) whose chopper has crashed, killing her husband and leaving her unconscious, implores her not to sleep. We know nothing about the back stories of these two individuals. This movie will not likely win an award for its screenplay. For cinematography and make-up, perhaps more plausible. As a result the movie lacks suspense, is missing the thing that so many stories depend on, namely whether we know enough about him to care. Nor are there major dramatic concerns other than one that also ends an act of Shakespeare’s play when Antigonus is pursued by a bear. Yes, there is a real live polar bear as a supporting player, a creature without the ethical motivation to save Overgård’s life but likely compelled to uproot and eat the human being who is trespassing in his digs. I’d venture a guess that the folks making this movie depend on Mads Mikkelsen’s star power. After all, this Danish-born heartthrob has appeared as Rochefort in “The Three Musketeers,” as Dr. Hannibal Lecter in the TV series “Hannibal,” and is wrapping up for his star turn this year in “Polar,” which surprisingly enough has nothing in common with “Arctic.” Handsome Mads Mikkelsen comes across here as an altruist who, though overwhelmed with the need to save himself, reaches out to prevent an unconscious woman from dying within hours from the icy, blizzard-wracked, tundra. He is a survivor. He catches fish through the ice and eats their insides raw as though feasting in the kind of Japanese restaurant that knows how to serve sushi fresh from the water. He has come equipped for such accidents, principally a flair to attract choppers with altruistic pilots and to make animals think twice before serving themselves lunch. He must keep a woman communicating in a language she may not know. But other than a bout with a bear and a bad fall that cut his leg so deeply that you dread thinking that his leg will go the way of James Franco’s arm in “127 Hours,” all is repetitive. The cinematography is minimalist. There are no sets to navigate other than the plane and a chopper. There is only one person moving, virtually speechless. There are few is any digital effects. Like Overgård himself, Penna’s movie is not likely to be going anywhere.